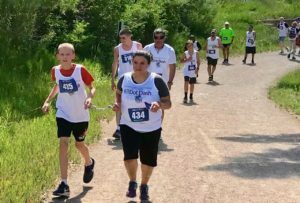 National Federation of the Blind of Colorado 6 Dot Dash – Come Run With Us! Registration for the second annual 6 Dot Dash is now open! REGISTER NOW for our in person OR virtual race! Join the National Federation of the Blind of Colorado for the second annual 6 Dot Dash. The 6 Dot Dash is a 5K Race to raise awareness and funds for Braille Literacy and blindness skills training. The name “6 Dot Dash” comes from the six dots which make up the Braille cell. A combination of these six dots makes up every letter in the Braille alphabet. For individuals who are blind or low vision, these 6 dots represent literacy, independence, and the opportunity to live the lives we want. Packet Pickup will take place on Friday, June 28th at the Colorado Center for the Blind (2233 W. Shepperd Ave. Littleton, CO 80120) from 4:00PM-7:00PM. This year, our expo offers something for the whole family! In addition to a bounce house, face painting, popcorn, cotton candy, Kona Ice, and Harley’s Hot Dog Revolution we have a whole host of exciting vendors including chair massage by It Works, Pampered Chef, Oroweat Organics, Dot Dot Smile, Ameritech Windows, Adventurist backpacks, Paparazzi Jewelry, Lula Roe, 5280 Silx, Mary Kay, Nurture and Nature, HealingoilsRN LLC, and much more. Many of the vendors will be donating a percentage of their sales to the National Federation fo the Blind of Colorado so use this as an opportunity to do your summer shopping! You can make a donation to enjoy activities such as face painting, the bounce house, popcorn, and cotton candy! The BEER TASTING is FREE just BRING YOUR ID!